research quality in-depth and the choice of an innovative design, the first dynamic tests on a Beaufort was completed in 2011. 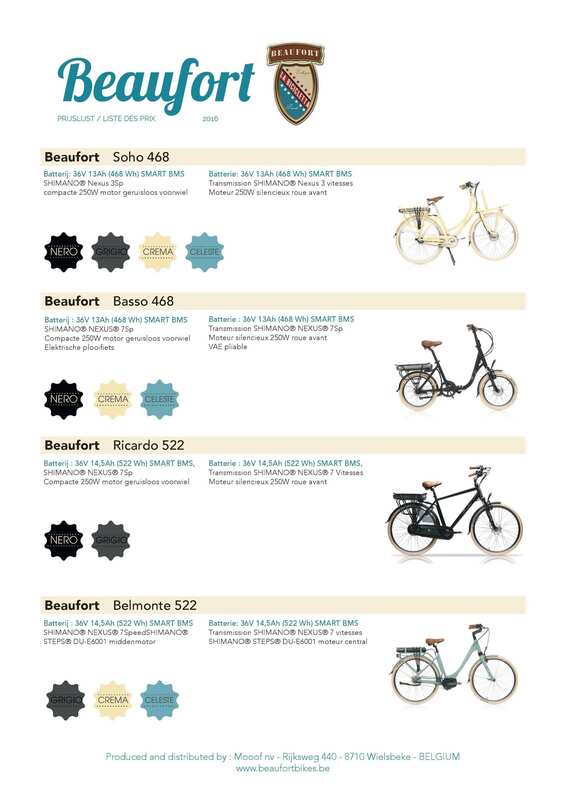 Beaufort offers a range of electric bikes réellementabordables, which uses cutting-edge technology, responding appropriately to the expectations of consumers. 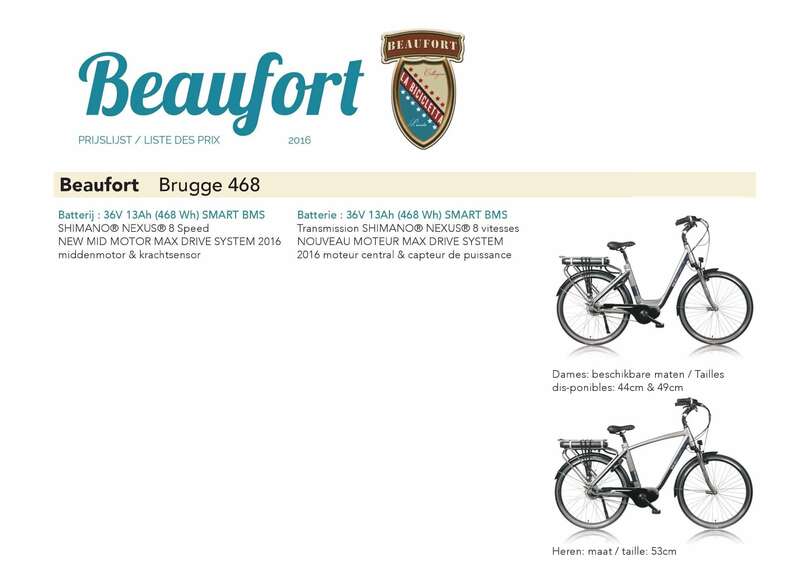 Beaufort has been developed in Belgium, one of the great countries of the ‘little queen’. Our offices and warehouses are installed in Wielsbeke, a central location ideal for ensuring a good serve in all of Europe. maintain in your retail space and workshops. 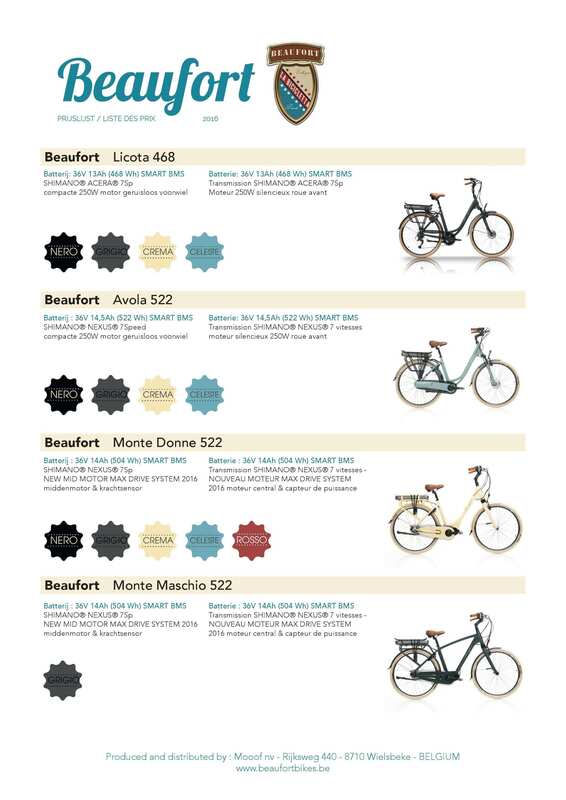 Beaufort is a Belgian brand who has designed bikes for all men and all women who love the bicycles to the authentic character. Choose Beaufort...the combination of the chic and rewarding technical expertise proven. The electric Bicycles of the brands Beaufort are equipped with high-tech components, comfortable for all women and all men, urban, chic, or with a bit of nostalgia, who wish to get around by bike, and enjoy long walks in the countryside at the weekend or during the holidays. The electric bikes Beaufort ally robustness and aesthetics by privileging one side Vintage and comfortable. The anti-theft AXA built-in VAE Beaufort is the standard reference in the field of anti-theft system. Brakes TEKTRO are the most effective in their field. The electric motors the models of which Beaufort are equipped, belong to the most powerful and silent currently available on the market. The bikes Beaufort are inspired bicycles of the past, at the character authentic, but benefit from the latest technologies currently available in the industry cycle. Opt for Beaufort is to choose the combination of chic with the sophistication of today without putting a strain to your budget when buying. This is what mainly characterized the products Beaufort : a pure style that is associated with a high-quality technology. The batteries of Beaufort are equipped with a BMS system (Battery Management system). The BMS is the manager of your battery that provides a driving without an equivalent. - Database functions : cycles of recharging, historical recharge interval recharge max. Beaufort also offers a folding electric bicycle high quality, which is distinguished by its light weight, its power, and of course its unique design. the bikes Beaufort are equipped to carter to completely cover the chain. With the brand Beaufort, to avoid the problems of derailment or of gears that creak thanks to the speed system built into the hub of the wheel. It facilitates the change of speed even with the stop (derailleur and integrated Shimano Nexus 7). The originality of the VAE Beaufort distinguished by their design and by the choice of colours offered.